Chris North, Sarah Roberts and Mat Allen discuss a number of recent news stories. One of the latest planets to be discovered, “40 Eridani A a”, seems to be a lot like the fictional planet Vulcan, home to Spock in Star Trek. The RemoveDEBRIS mission has test-fired its net, and the Hyabusa 2 mission has successfully sent to rovers bouncing around the asteroid Ryugu. There’s also new results from the Gaia satellite, a new wind-monitoring satellite, and the discovery of dust storms on Titan. 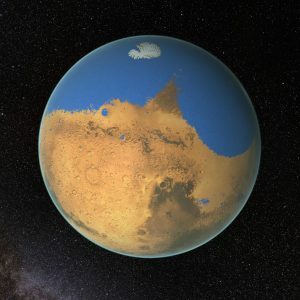 With news of the discovery of water on Mars seeming to hit the headlines every few months, it seems time to focus on what we know about Mars and its geology. Dr Joel Davis, from the Natural History Museum in London, researches Martian geology, and explains all about its history, and what we mean when we talk about discovering water on Mars. An extended edition of an original broadcast on 27th September 2018 as part of Pythagoras’ Trousers on Radio Cardiff.